With their frisky whiskers, fuzzy tails, and soft wool felt bodies, Purl Soho's Bunny Finger Puppets are totally irresistible. 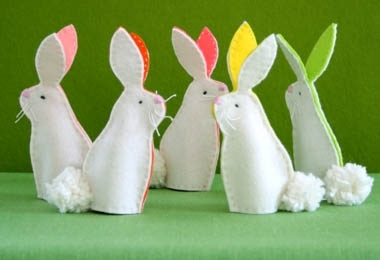 Each Kit includes enough materials to make a family of twelve sweet bunnies, sure to bring lots of cheer! Please click Product Details, above, for a complete list of the Kit's contents. Eight Wollfilz's Wool Felt Pieces, 1mm, 8 x 12 inches. A hank of ecru yarn (for pom pom tails). We used Appleton's Tapestry Hanks in the color White. These are enough materials to make a dozen finger puppets.